Las Vegas in triple digit temperatures. But it's a dry heat, right? During my early days of the Timbers Army, I never missed Timbers matches. While that was great for soccer viewing, it made scheduling time off a royal pain. Moving into the media world, it makes down time even more relevant and necessary. After the literal bonfire that occurred when the Seattle Sounders FC visited on June 25 - the match was delayed from an afternoon start to a Sunday evening kick due to extreme heat in the Portland area - the Timbers watched their rivals jump to an early lead off an unfortunate deflection only to then storm back with goals from Fanendo Adi and Dairon Asprilla to take a 2 to 1 lead into the break. The Sounders increased their attack late in the match and stole the victory late due to a defensive breakdown; while the result did yield a point, it cost them Diego Chara and Amobi Okugo due to injuries that will keep them out for up to 6 weeks. My wife and I had been talking about escapes for the early summer, and the opportunity to venture to Las Vegas around the 4th of July holiday presented itself a few months ago so we jumped at the chance to head south. 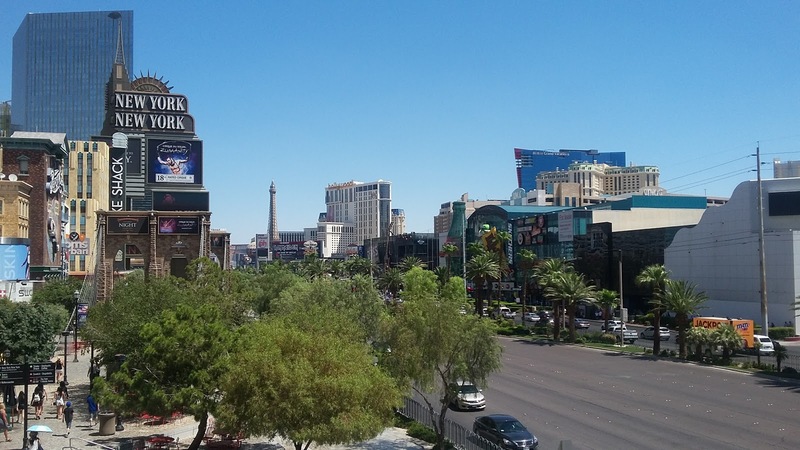 While getting a chance to stay at the renovating Monte Carlo resort provided relief to our budget and a prime Strip location for fun, this did mean watching the Timbers match versus Sporting Kansas City in Kansas from the road. We did plan our trip so that we would make it back in time for the Timbers' next fixture, a home date with the Chicago Fire on July 5. The various highlights of the journey include a very entertaining departure from the PDX airport - thankfully our Alaska Airlines crew provided entertainment during the delay - some wonderful service individuals at the hotel and in our taxi rides, exceptional food at Aria, P.F. Chang's and the Mirage, a few early gambling wins that let me purchase a soccer ball watch at Swatch, and a wonderful concert by Ricky Martin. We did squeeze in some pool time on July 1 where I wore my new Timbers primary kit out to the MGM Grand Pool complex, but it still was odd walking by the sports book and see the Timbers v SKC on the big screen. A few folks reminded me about the match while walking through New York, New York to get back to our hotel room, but we made it back for the second half to watch a fairly thrilling 1 all draw. Unlike the result with the Sounders that felt very deflating, the SKC draw appeared to be a more positive result despite Portland having several chances to steal the full 3 points. SKC is a tough team at home, however, and watching Tim Melia save Diego Valeri's penalty kick attempt in the second half buoyed the home side's effort. The Fire were busy drilling Vancouver at B.C. Place by a 4 to 0 scoreline, and so you could imagine some hesitation and concern for the Timbers coming into the home match with 2 consecutive draws and limited player availability. Okugo and Chara joined Jack Barmby and Liam Ridgewell on the injured list, but the most concerning situation there was a reinjury by Ridgy that pushed out his return by an additional 8 weeks and likely helped push for a change in their training staff. With David Guzman, Alvas Powell and Darren Mattocks all on international duty and newly signed Larrys Mibiala not eligible to play until the summer transfer window opens on July 10, the Timbers essentially had 17 players available for the Fire match although a lengthy break awaited the team after the match. Portland scored early behind an Adi conversion on a penalty, but watched the Fire knock in two goals to take a lead and subsequently try to park the bus. Sebastian Blanco wrecked that strategy with a 70th minute goal, but Portland wasn't able to get another goal and the teams played to a thrilling 2 all draw. Timbers Coach Caleb Porter used a similar lineup to the group used at Sporting with Jake Gleeson in goal, flanked by Vytas and Zarek Valentin at the fullbacks. Roy Miller and Lawrence Olum again started as the center back duo behind the defensive midfield duo of Ben Zemanski and Darlington Nagbe. Sporting the captain's armband, Valeri would anchor the attacking midfield as the center cog with Blanco and Asprilla as the wings with Adi up top. Bench wise, Portland listed every available first teamer as available subs with defenders Rennico Clark, Chance Myers and Marco Farfan, forward Jeremy Ebobisse, midfielder Victor Arboleda and goalkeeper Jeff Attinella. Zemanski actually help up well versus SKC in the central midfield, but the Fire presented a different challenge with Juninho and David Accam in the middle, being very active players who are exceptional passers. The Fire didn't play Dax McCarty (away for international duty) and Bastian Schweinsteiger (rest), but they did have MLS leading scorer Nemanja Nikolic up top flanked by wings Arturo Alvarez, Luis Solignac and Michael de Leeuw. The big story in Chicago, however, has been the marked improvement on the defense in conceding just 17 goals in 18 games played in 2017, led by Brandon Vincent, Joao Meira and Johan Kappelhof. Dairon Asprilla was all over the place. In a good way. Zemanski and Adi hooked up right off the opening kick with Adi putting a header just over the bar, and both players got additional chances around the 17th minute, but it was Adi that broke open the scoring in the 24th minute. Valeri put a cross into the box that Asprilla was able to head to Adi, but the ball took a large bounce that allowed the Fire defense to collapse, but in the process of trying to dispossess Adi, Juninho's slide tackle caused him to handle the ball and Center Official Robert Sibiga pointed to the spot. This situation gave the Timbers their fourth consecutive match with a penalty kick with Adi and Valeri splitting conversion duties, and in this instance, Fanendo took the restart and slammed it past Lampson to put the home side up 1 to 0. Adi and Blanco had back to back attempts blocked and just missed in the 27th minute, and it looked like the home side might add another until the Fire got a goal off an unfortunate gaffe. Off a counter run against the run of play, Alvarez put a cross into the box for Nikolic at the spot as Miller and Olum were split away from him and Valentin kept him onside on the flank. With just Gleeson frozen at the goalline, the cross found the inner part of the left post to level the score, and while Nikolic was originally credited with the goal, it was determined that Alvarez was the scorer. Valeri missed on a bicycle kick in the 36th minute and had another shot blocked in the 41st minute, but the scoreline didn't change as the match hit the halftime break. The halftime stats showed Portland with advantages in shots (9 shots, 3 on target), total passes and possession percentage, but it was the Fire that made a slight change in formation by pulling Juninho further back to the defensive line to give them 5 in the backline. As both sides traded runs back and forth between the 46th and 57th minutes, it was the Fire that took the lead off a broken play and slow marking. Accam was loose on the right flank and found Alvarez near the top of the box for a shot, but the effort skipped to Vincent on the left flank just outside the box. Vincent chipped a shot past Gleeson and a scrambling Timbers defense - again the Timbers defense was slow to react and find their marks quickly - and the visitors suddenly had a 2 to 1 lead. The Fire's defensive approach seemed willing to allow Portland to possess and try to attack in stages, hoping that their five man line would be sufficient to cover ground and chances. Portland spent the minutes after the concession unleashing various shots by Valeri, Asprilla, and Olum (a shot from distance off a corner), but the Timbers finally were able to pull even in the 70th minute courtesy of Blanco. Darlington Nagbe played central midfield & did pretty well. Off a turnover at midpitch, it was Valeri who started the play by finding Valentin off the right in space. Valentin poured forward and dropped it to Asprilla in support, and before the Fire defense could track him down, he dropped it back to Valeri just behind him as Blanco settled in on the right flank open and level with the Fire defense. With the defense converging on Valeri, Diego slotted a pass to Blanco just inside the box, and the midfielder was able to curl a shot just inside the left post to level the score. Although Valeri got the only official assist, the play was really helped by the support runs from Valentin and Asprilla, who was giving the Fire headaches with his tireless work box to box drawing defense to him. With just over 20 minutes left, it appeared there might be some more goals left in this one, but would anyone find the winning goal before time expired? Nagbe tried his luck in the 77th minute with a distance shot, and Nikolic forced Gleeson to make a sprawling palm save in the 83rd minute to push his shot over the bar for a corner. Porter finally brought in his subs in the 87th minute replacing Vytas with Farfan and Zemanski with Arboleda, and the two youngsters nearly combined on a wonder goal in the 88th minute when Farfan found an open Victor on the left with just Lampson to beat. However, the ball got stuck between Arboleda's boots and he was unable to get a shot attempt on goal. The Timbers appeared to have earned the goal off a Farfan cross just into stoppage time as the Timbers' defender found Adi and Asprilla at the right post, and Asprilla headed the ball into goal. However, Adi and Meira tangled before the cross and Meira drew the foul on Adi with Fanendo's arms extended to create space. The crowd was very upset at Sibiga, but perhaps more ire was being leveled at Meira, who had spent much of the match tangling with Adi and executed several well timed falls to draw fouls or giving Adi a few well timed elbows or grabs. Arboleda got a final chance at the death off another pass, but another blocked shot and the final whistle left the teams drawn with 2 goals each. Both sides could point to chances for a full victory, but the Timbers can say at least statistically, they had one of their most dominant efforts this year. Sebastian Blanco scored his first goal at home for 2017. Portland now gets an extended break for the Gold Cup competition, as their next scheduled MLS match is on Wednesday, July 19th when they host Real Salt Lake, followed up by road trips to Vancouver on July 23 and Houston on July 29. This fact means that Mibiala will be available for RSL, and the hope is that some of the other Timbers' injured will be available while the club await the return of Guzman, Mattocks and Powell once their sides are eliminated from the Gold Cup schedule. While Valeri and Adi should get some credit within the Timbers' efforts versus the Fire, my man of the match is Asprilla who was giving the Fire trouble all night. Blanco certainly contributed to some of the trouble as well, while it was good to see Zemanski and Nagbe handle their respective roles very competently and solidly. Nagbe's statistics were very impressive considering he completed 95 percent of his passes and was third of the team in touches, but he also seemed to be in the right place as an outlet when the Timbers needed to find space to attack. Considering the team was playing various substitutes in key roles playing the top team in the Eastern Conference, the result is certainly impressive under the circumstances.